What Happens When a Penguin's Egg Falls on the Ice? 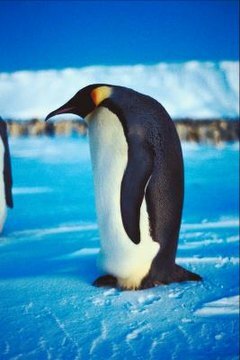 Of the 19 species of penguin known to science, only the emperor penguin incubates eggs atop the ice. Emperor females each lay one egg per nesting season, and the males incubate their mates' egg on their feet for two months while the female lives out at sea to feed. What happens if his egg drops on the ice depends on the behavior of the male. Wedged between a roll of the dad's abdominal fat and the top of his feet, there is little likelihood of the egg becoming dislodged. Male penguins stand in groups, moving during the incubation process only enough to help keep one another warm. Should the egg fall from its cozy cradle onto the ice, the egg's elliptical shape will cause it to roll in a circle, enabling the dad to maneuver it back into place with no harm done. The fall from the dad's feet onto ice is less than an inch, which would not cause the egg to crack or break. The male may intentionally drop an egg on the ice and abandon it if hunger overpowers his paternal instincts. This happens if the mother does not return just before hatching time to resume care of the egg. A mother penguin may have met an unfortunate end at the jaws of the shark or other sea creature, for instance, and without her the egg would hatch into an environment where it does not have sufficient parental care. What Male Animals Have No Part of Raising the Young?